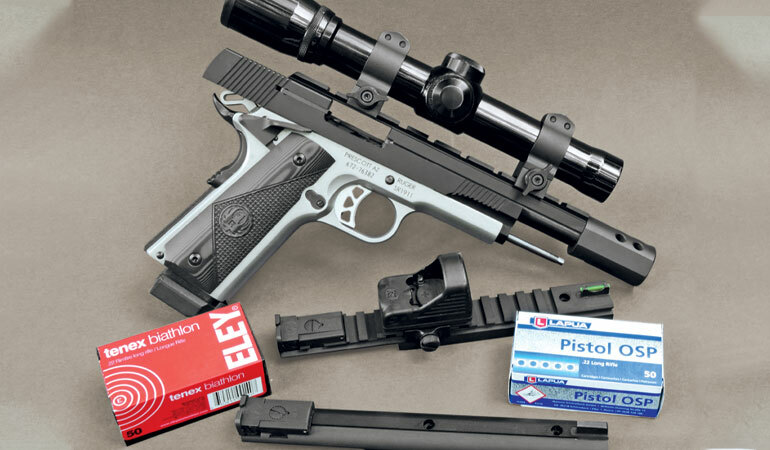 Ruger’s SR1911 Target in .45 ACP MATED with a pair of Marvel Custom .22 Rimfire conversion kits makes for an accurate, 100-percent-reliable combination. I have been shooting the Model 1911 pistol for a very long time and became fond of .22 Rimfire conversions for it when I discovered a Colt Ace at a gun show decades ago. That first unit was eventually joined by several others. I had been looking for an excuse to dust off a couple and was on the lookout for a new standard-production pistol to try them on. 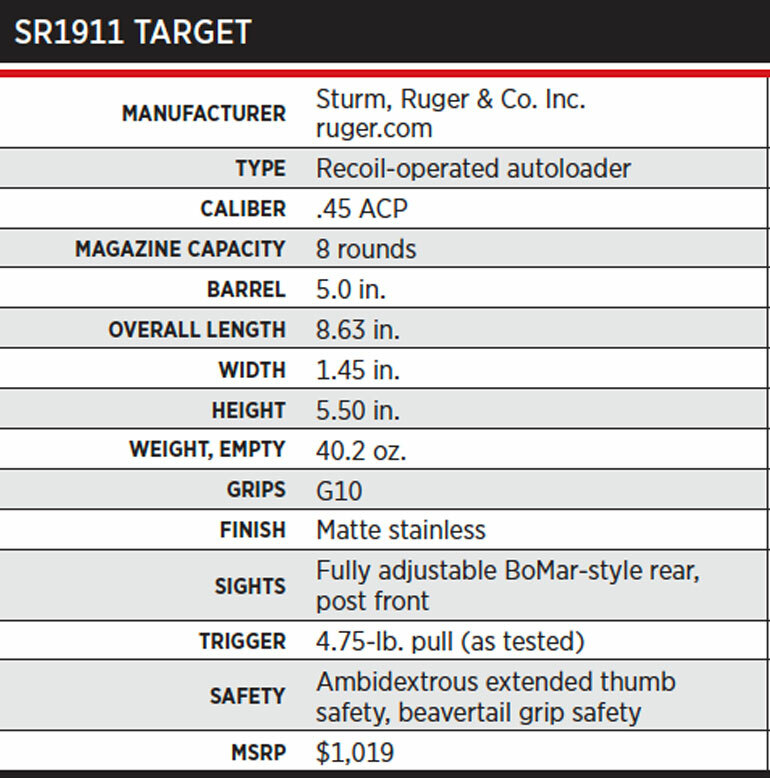 The recently introduced Target version of the Ruger SR1911 filled the bill. Ruger introduced the standard version of the SR1911 in 2011. Still in production and selling quite well, the SR1911 has a standard-contour, 5.0-inch barrel in .45 ACP and weighs 39 ounces. A 4.25-inch “Commander” weighing 36.4 ounces was introduced in 2013 and was soon followed by a lightweight version with an aluminum frame that reduced weight to 29.3 ounces. The new Target version is available in 9mm, 10mm Auto, and .45 ACP. The 9mm and 10mm have heavy, no-bushing barrels, while the .45 ACP has a bushing-style barrel of standard contour. Grip panels also differ: hard rubber on the 10mm and G10 synthetic on the 9mm and .45. All barrels are stainless steel, but the 9mm and 10mm have black nitride exterior finishes. Stainless-steel recoil spring guides are full length on the 9mm and 10mm and standard length on the .45. With the exception of its barrel-stabilizing feature, side-attached extractor, and bushingless barrel, the Marvel Precision Unit 2 conversion closely follows the original 1911 design. It and the Unit 1 conversion install on any 1911 lower in less than a minute. The slide is machined from Type 416 stainless-steel bar stock, and it has a nonglare exterior finish. Six wide grasping grooves are at the rear. An extended ejector and a lowered and flared ejection port ensure the reliable ejection of spent cases. And just as John Browning intended, a bit of vertical play in the barrel hood during lockup along with slight vertical and side-to-side looseness in the slide-to-frame fit allows the gun to operate when extremely dirty. The barrel bushing on my test gun was tight enough to eliminate any detectable looseness, but during takedown, it was easily turned with finger power alone. The Target is nothing more than the standard SR1911 with the addition of a fully adjustable rear sight and an ambidextrous thumb safety with extended and widened tabs. Consequently, the company does not promote the new variation as a match-grade gun, although it does offer sufficient accuracy to be a winner not only in IDPA competition, but also in the single-stack division of USPSA competition. It is also plenty accurate for personal-defense use. Fired from my Ransom Rest, the Target averaged less than 2.0 inches at 25 yards with five of nine loads, and I consider that excellent accuracy for any box-stock Model 1911 pistol. The barrel and its bushing are also machined from Type 416 stainless-steel bar stock. The barrel is outside-contoured by CNC machining and then bored and broach-rifled with six lands and grooves at a right-hand twist rate of 1:16 inches. Light beveling at the muzzle ensures clean bullet exit. As should be on a 1911 pistol, the sights are dovetailed to the slide. The fully adjustable rear sight is a copy of the famous (and extremely rugged) BoMar, and its 0.130-inch-wide notch leaves enough daylight on either side of the 0.135-inch-thick front blade for a quick and accurate sight picture. The lightweight trigger was a bit rough at first, but it became much smoother toward the end of my shooting sessions. Pull weight was a fairly consistent 4.75 pounds. The trigger has an overtravel adjustment screw. The hammer is Commander style, and a speed bump on the high-sweep grip safety is appreciated by those of us who shoot the 1911 with a high-hand hold. The SR1911 Target was the first variation offered by Ruger with a fully adjustable rear sight. It’s similar in design to the classic BoMar rear sight, and it’s dovetailed into the pistol’s slide. The SR1911 Target also features an ambidextrous thumb safety, a lightweight trigger with an overtravel adjustment screw, a Commander-style hammer, G10 grip panels, and a high-sweep grip safety with speed bump. The frontstrap is smooth, while the surface of the flat mainspring housing has fine checkering. On the original 1911 design, the thumb safety plunger tube is a separate part staked to the frame, but on the SR1911 it is integral with the frame. The extended magazine release is checkered, and beveling at the mouth of the magazine well makes for smooth magazine insertion. The SR1911 Target comes with seven- and eight-round stainless-steel magazines, and both earned clean bills of health during my shooting tests. Not a single malfunction was experienced. Some 1911s I have shot did not become 100 percent reliable before digesting a few hundred rounds, but I have now worked with two SR1911s (the other was the Lightweight “Commander” in 9mm), and both proved to be totally reliable fresh from their factory boxes. Ruger specifications describe the SR1911 as “classic, original 1911 Series 70 design,” which means it has no mechanical firing pin block. Layne’s Marvel Precision Unit 1 has three interchangeable sight ribs that attach directly to the barrel. When accuracy-testing the Marvel Precision Unit 1 .22 LR conversion at 50 yards, equipping it with a Burris 2.75X LER scope enabled Layne to accurately adjust the Ransom Rest between each group for a maximum number of groups on a blank paper target. 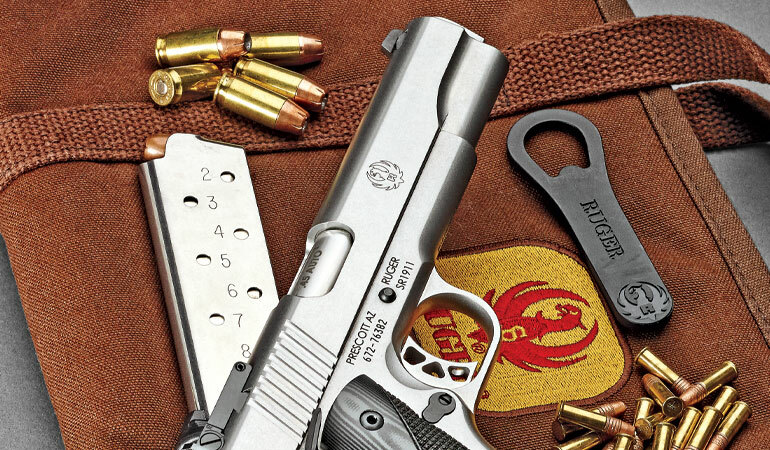 At the beginning of this report I mentioned my favorite .22 Rimfire conversions for the 1911 pistol, and I will now reveal that both are from Marvel Precision. The Unit 1 conversion is often described as “Camp Perry accurate” because since its introduction by Bob Marvel and Lamonte Drees during the late 1990s, shooters there have used it to chalk up more than 60 titles and national records in NRA .22-caliber Bullseye competition. Of different design, the less expensive Unit 2 is intended for plinking and casual target shooting. Both are compatible with any Model 1911, and it takes less than a minute to switch from centerfire to rimfire and back again. No modifications of the 1911 lower are required. Unlike most .22 Rimfire conversions, the barrels of both Marvel units are locked rigidly into the frame by using a supplied wrench to tighten the recoil spring rod hard against the crosspin of a two-piece slide latch that comes with the unit. 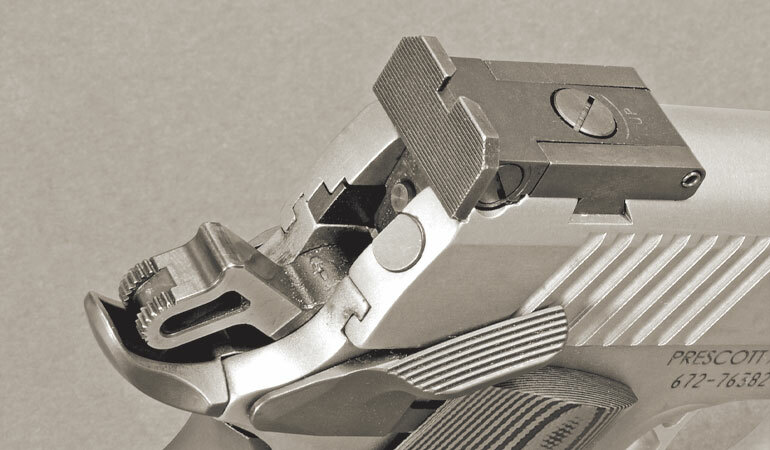 Both will function with a standard 1911 latch, but with either unit installed and the guide rod tightened, the latch cannot be rotated to lock back the slide. The purchaser chooses between two versions of a special two-piece latch; one is for manually locking back the slide, and the other automatically locks it back after the last round in the magazine is fired. By the way, barrel lengths are 5.3 inches for the Unit 1 and 4.8 inches for the Unit 2. The sights of the Unit 2 are attached to its slide, same as on the 1911 pistol. The Unit 1 has a sight rail attached directly to its barrel, and its slide reciprocates independently. This eliminates any misalignment between shooter aim and bullet path, which is inherent in the 1911 design. Unit 1 is offered with an aluminum or steel slide. Unit 2 comes only with an aluminum slide. A hardened steel insert in the breechface of the aluminum slide eliminates any battering of the slide by the barrel during the firing cycle. Except for its barrel-stabilizing system, side-attached extractor, and lack of a barrel bushing, Unit 2 closely follows the original 1911 design, while the functioning of the Unit 1 design is much like that of the Smith & Wesson Model 41 .22 target pistol. Interchangeable sight rails with Weaver-style cross notches are available for the Unit 1, and they can be quickly switched without loss of zero. Mine has three rails: one wears a scope, one is for a Trijicon RMR sight, and one came with BoMar-style fully adjustable iron sights. Using standard-velocity ammunition, standard recoil spring weights are 9 pounds for the Unit 1 with an aluminum slide and 6 pounds for the 2-ounce-heavier steel-slide version. The Unit 2 conversion ships with an 8-pound spring for use with high-velocity ammo, but mine also functions with most standard-velocity loads. Should either unit refuse to cycle reliably with a particular load, installing a lighter spring should correct the problem. Case ejection distance for my Unit 2 with a new 8-pound spring installed averages 4 feet, and the spring is replaced when the ejection distance begins to consistently exceed that. If case ejection is still excessively muscular with a load, switching to a 9- or a 10-pound spring is in order. I always replace the spring in the Unit 1 every 4,000 rounds whether it needs it or not. Springs made by Wolff are available from Marvel Precision in weights of 4, 5, 6, 7, 8, 9, 10, 11, and 12 pounds. Like most high-grade semiautomatic rifles and pistols used in competitive shooting, the match-grade barrel of the Unit 1 conversion utilizes a Bentz chamber. The fit between a cartridge and the chamber wall is closer in it than in the standard SAAMI-dimension sporting chamber but not as close as in a match chamber, which is usually reserved for bolt-action rifles. The match chamber is also a bit shorter than the Bentz chamber, and both are considerably shorter than a sporting chamber. When a cartridge has entered a match chamber, its bullet fully engages the rifling, and while there is no rifling engagement in the Bentz chamber, the bullet is positioned much closer to the rifling than in a sporting chamber. The barrel of the Unit 2 conversion is not match grade, and it has a sporting-dimension chamber. That along with design differences accounts for a considerable difference in accuracy performance between the two units. Prior to its departing the factory, the Unit 1 conversion is accuracy-tested from a Ransom Rest. 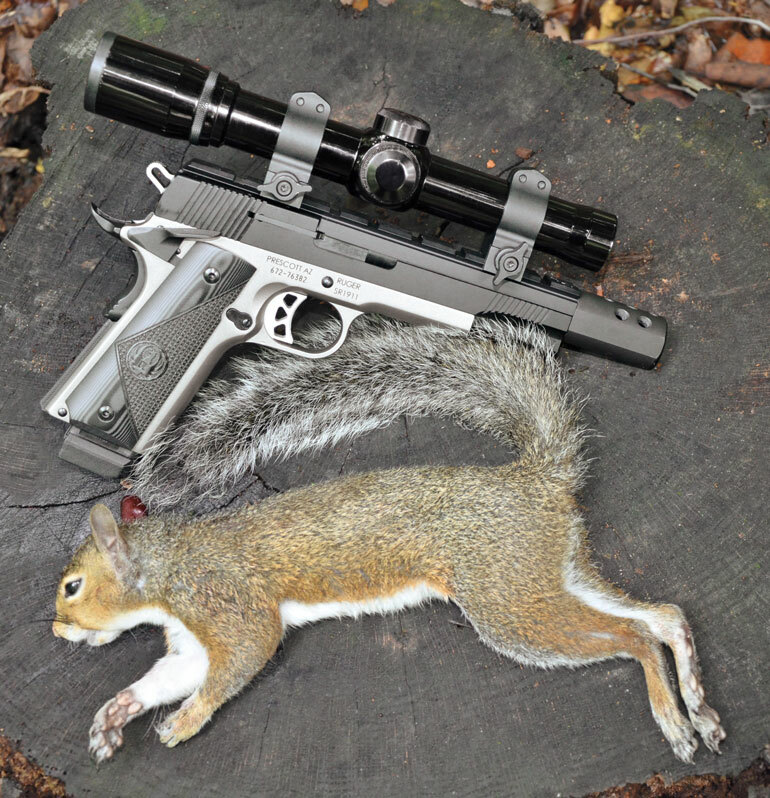 It will not be shipped until it shoots inside an inch at 50 yards with match-grade ammunition. When digesting selected lots of some loads, mine consistently shoots inside half an inch at that distance. 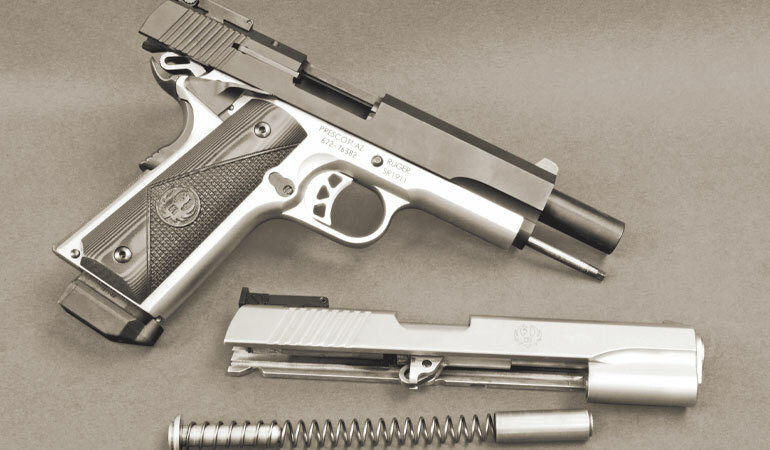 The Unit 2 will usually equal (and sometimes outperform) the accuracy of a standard-production 1911 pistol that is wearing the centerfire upper. The Unit 1 instruction booklet does not forbid the use of high-velocity ammo, but since it was designed specifically for precision target shooting, I believe only standard-velocity ammo should be used over the long haul. When I first received mine, I installed a heavier spring out of curiosity and tried several high-velocity loads. A couple averaged less than an inch at 50 yards. Group size with subsonic ammo loaded with hollowpoint bullets averages about half that, and since it is plenty effective on small game inside 50 yards, I no longer use high-velocity ammo in the Unit 1. It is extremely rare for my Unit 1 to malfunction. It is less choosy about ammunition than my Unit 2, although it also runs smoothly with ammo of its choosing. I clean about every 1,000 rounds, using a toothbrush and solvent to remove fouling from the breechfaces of the slide and barrel. A thin coat of lubricant is then applied to the slide rails. When cleaning the bore, it’s best to remove the barrel from the slide and clean from the chamber end. Depending on which sight/scope rib is specified, prices of the Unit 1 range from $484 to $569 for the non-lock-back version and $15 more for automatic slide lock-back. The Unit 2 has an MSRP of $382 and comes with fully adjustable sights or a sight rail with Weaver-style notches. Both units come in heavy-duty hard cases with one 10-round magazine. Extra magazines are $24. 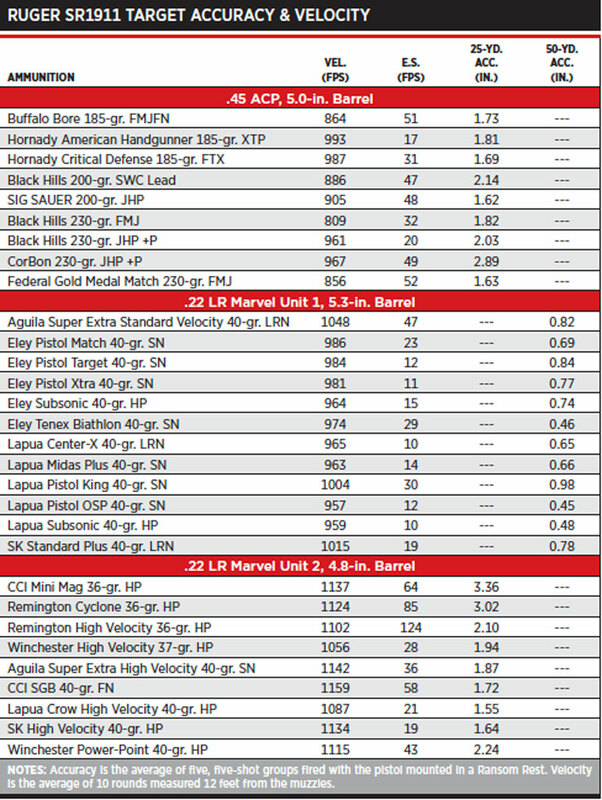 As you can see from the accuracy and velocity results chart, the Ruger SR1911 Target proved to be a terrific matchup with both conversions.